110’ x 66’4” x 17’11"
303 mph at 25,000 feet. 4 1200hp (895 kW) Pratt & Whitney R-1830-65 Twin Wasp 14-cylinder two-row radial engines driving three-bladed propellers. 10 0.50 machine guns in dorsal, ventral, and tail turrets, in the nose, and in waist bulges. 2850 miles (4586 km) maximum. 2066 gallons in 12 self-sealing fuel cells. British Lend-Lease models were equipped with ASV Mark II radar by the time war broke out in the Pacific. An American version of ASV Mark III radar was available for aircraft produced after 1942-3. 2738 B-24D at Consolidated/San Diego. The LB-30 was an early model that lacked power turrets, being armed with 11 0.30 machine guns in flexible mounts. A small number of LB-30s saw combat in Java in early 1942. The B-24C was the first variant with power turrets and turbocharged engines, closely resembling the D but produced in very small numbers. 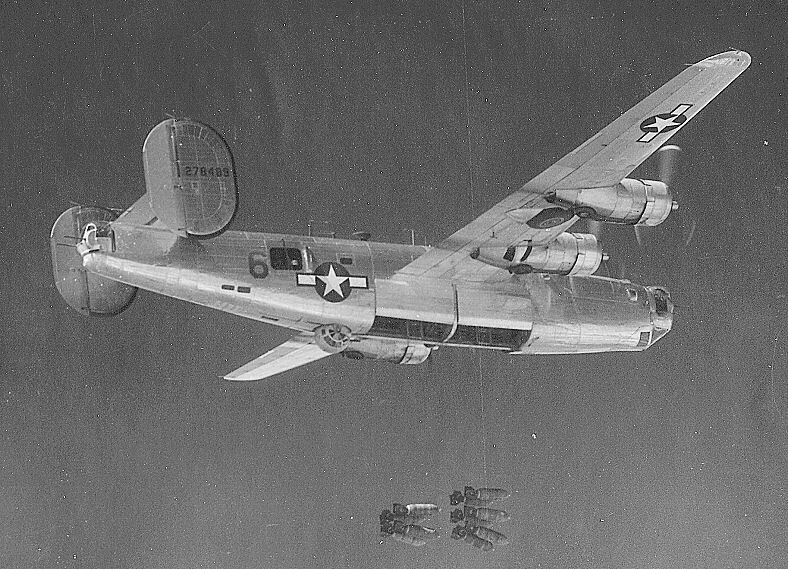 The first version produced in quantity was the B-24D with increased fuel and armament. The main production versions were the G, H, and J which differed from each other only in minor details. 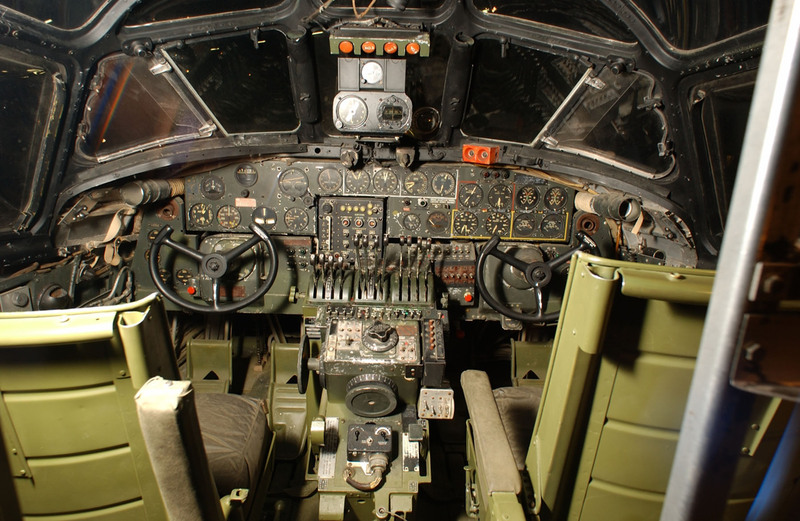 The G standardized the powered nose turret, which had been a field and depot modification of the original three flexible nose guns of the D.
The PB4Y-2 Privateer replaced the twin stabilizers with a single vertical stabilizer and added a flight engineer station. The ventral turret was replaced with an ASG radome. The C-87 (RY-1, -2, and -3 in Navy service) was a transport version carrying up to twenty passengers with a crew of give. Over 280 were built. The F-7 was a photoreconnaissance version that saw service in the Pacific. A tanker version, the C-109, was converted from other models and capable of carrying 2900 gallons (11,000 liters) of fuel, of which about 200 were built. This version was nicknamed the "C-One-Oh-Boom", though it did not in fact suffer excessive operational losses. On the other hand, it was not particularly successful, perhaps because its intended role (transporting fuel to China for the B-29s) was an exercise in futility. 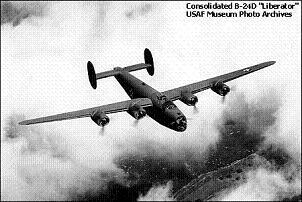 The B-24 was intended as the successor to the legendary B-17 and incorporated a number of advanced technologies. It was rather clumsy in appearance due to the placement of the low-drag Davis wing high on the fuselage. However, this avoided running the engine spar through the bomb bays, allowing a very large bomb capacity, and the Davis wing gave the B-24 excellent range and speed. It was somewhat less rugged than the B-17 and could not fly as high. In some ways it was a disappointment, being a slight improvement at best on the B-17, in spite of being conceived five years later, and being much more complex and expensive. The design dated to 1939, when the Air Corps suggested to Consolidated that they open a second line for manufacturing B-17s under license as part of Project A, a massive expansion of air power production capacity. Consolidated chose instead to rush development of its own heavy bomber design, using the Davis laminar flow wing and tail assembly from the earlier Model 31 flying boat proposal. The wing spars were widely spaced to accommodate large fuel tanks and ease of manufacture was an important consideration in the design. The proposal was accepted on 30 March 1939 and the prototype first flew on 29 December 1939. The Davis wing was an unusual design was a thick wing with short chord and a high aspect ratio. This promoted laminar flow over more of the surface of the wing than more conventional designs. Laminar flow was maintained to 20%-30% of chord versus 5%-20% for more conventional designs. This allowed a high angle of attack for greater lift and minimized drag, giving an aircraft using the wing a greater range. The thick wing also looked attractive for fuel storage and for embedded engines, though the latter concept fell out of vogue. Wind tunnel tests at Caltech were so favorable that the engineers repeated the tests three times, then worried that they were a "wind tunnel fluke." However, the Davis wing was not without its disadvantages, and was abandoned postwar because its thick section promoted high-speed drag. It was quite sensitive to ice formation, and, beginning with the B-24G, the wing was equipped with a heated deicing system. This also provided heat to most of the crew stations. The wing was also vulnerable to battle damage due to its high loading, which could mean critical loss of lift if the surface was shot up. 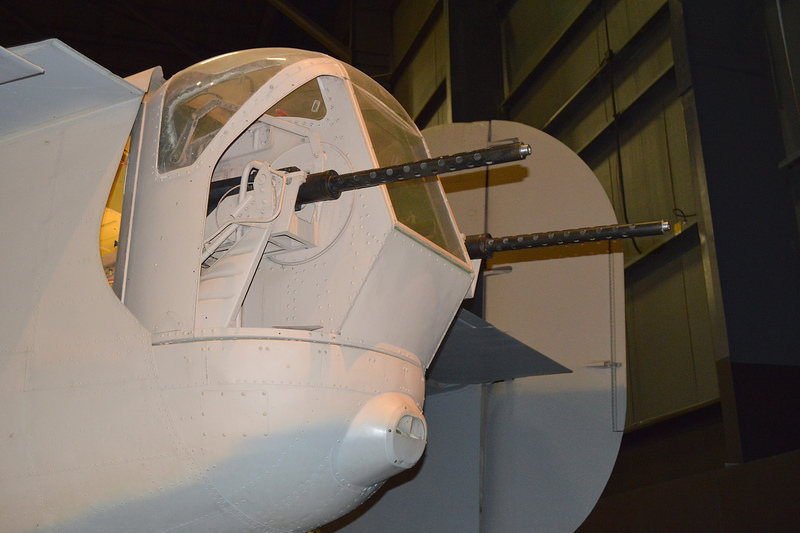 Unlike the B-17, whose earliest versions entered combat without adequate nose or tail armament, the first mass-produced Liberator model, the B-24D, was well-armed, with electrically powered twin-gun tail, ventral, and dorsal turrets, in addition to pairs of waist guns and nose guns. 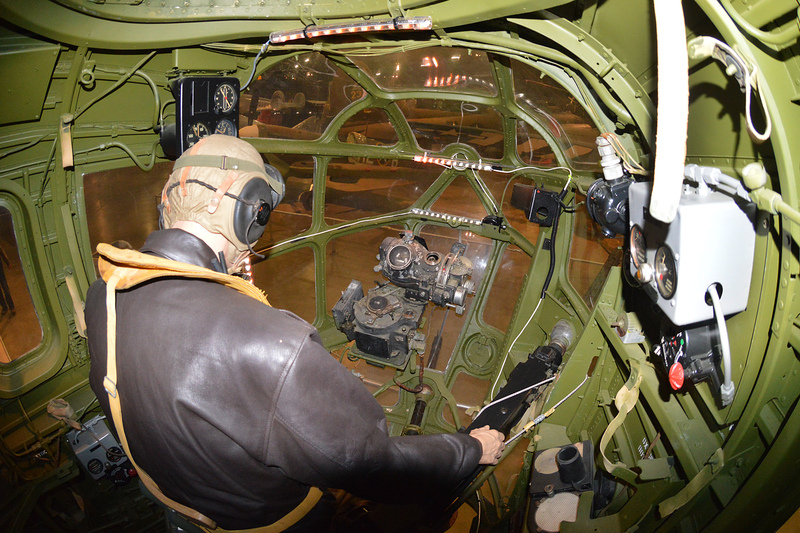 The ventral turret was initially the unworkable remote-controlled turret that also used on early production B-17s, which was replaced by the much superior Sperry turret. 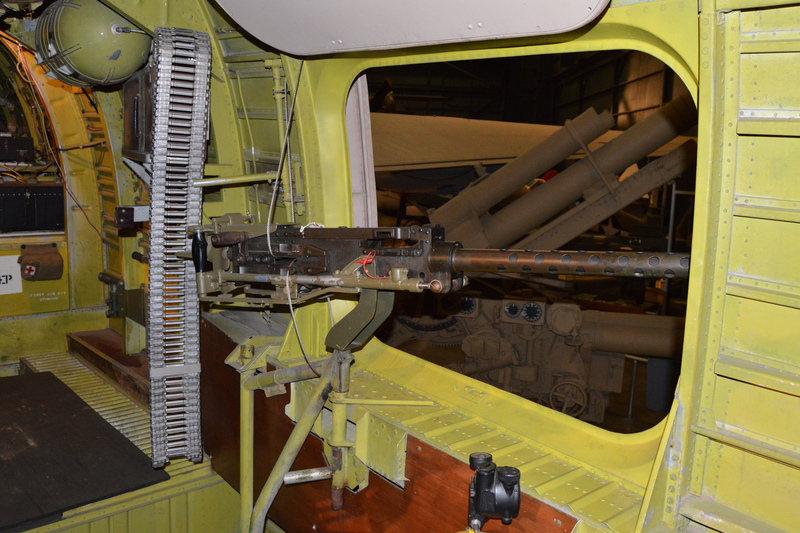 The flexible nose guns were replaced with a powered turret as a field and depot modification and became a standard feature beginning with the B-24G. The twin bomb bays gave the aircraft a large bomb load and the ability to load a large reserve fuel tank while carrying a half bomb load. 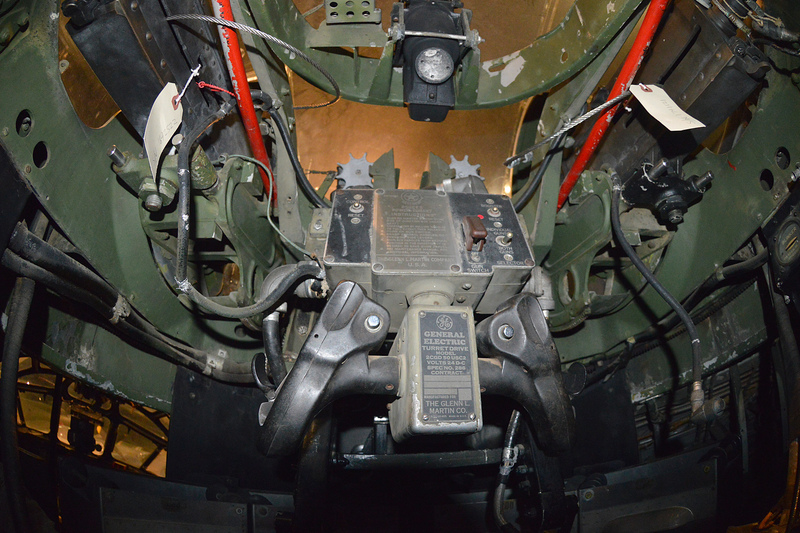 The bomb bay doors were of rolling design, which reduced drag when the bomb bays were opened. This allowed high speed to be maintained over the target. The British equipped their Lend-Lease B-24s with ASV radar from the very start, for use in antisubmarine warfare in the Atlantic, and it is likely that the U.S. quickly copied this. The Liberator closed the "air gap" in the Atlantic and thus ensured victory in the U-boat war. In the Pacific, far-ranging Navy PB4Ys took a substantial bite out of the Japanese Merchant Marine and did their part to wreck port facilities. The PB4Y was still under development when the ASG radar was coming into production, and became the first aircraft purposely designed with space for a radar set. The most remarkable aspect of the B-24 was its massive scale of production. Ford’s Willow Run aircraft factory, which applied true mass production techniques to aircraft manufacture, produced a B-24 every 50 minutes once the assembly line was up and running. 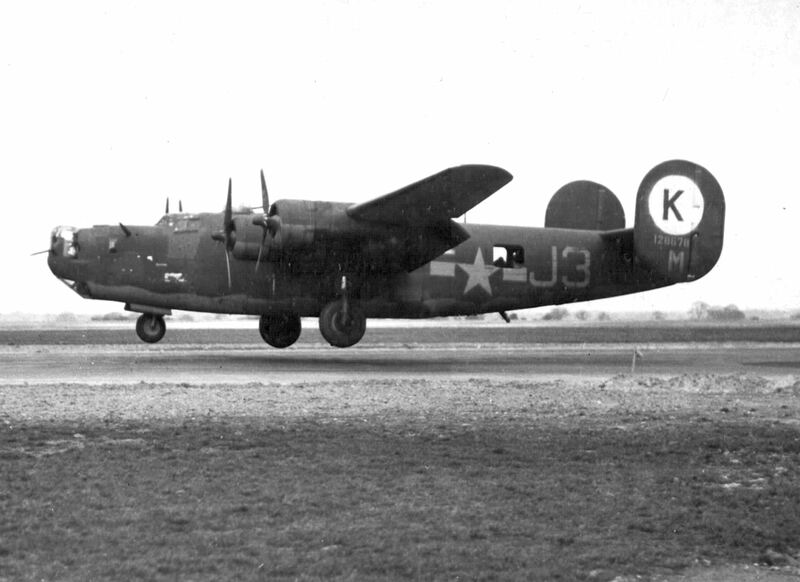 As a result, more B-24s were produced during the war than any other aircraft. This was enough to supply every U.S. combat theater and still have aircraft left over for Lend-Lease to 15 Allied nations. 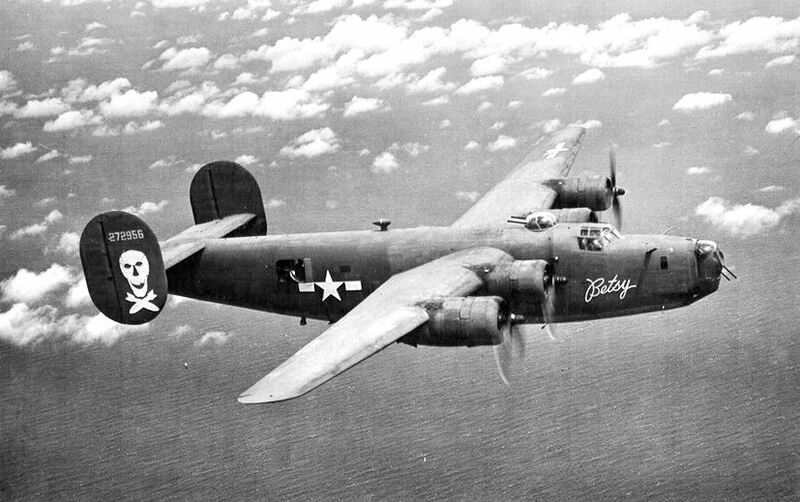 The B-24 was the only heavy bomber deployed in some theaters, including China and Burma, until superseded by the very heavy B-29 Superfortress. Production was also sufficient to support an unusual variety of special versions, such as reconnaissance, tanker, and transport versions. The C-109 tanker was meant to transport gasoline across the Himalayas to the B-29 airfields in China, but proved unsuccessful in this role. Comparisons to the B-17 were inevitable. Flight crews complained that the only exit, at the rear of the aircraft, was almost impossible for the pilot and copilot to reach while wearing parachutes. The fuel system had a reputation for leaking into the wing and bomb bays. 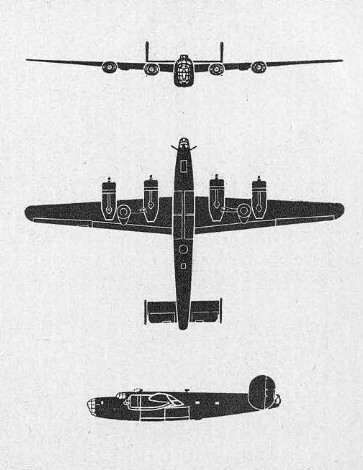 The reputation of the B-24 for having a cramped nose area for the navigator and bombardier, compared with the B-17, seems to have had some basis in reality. 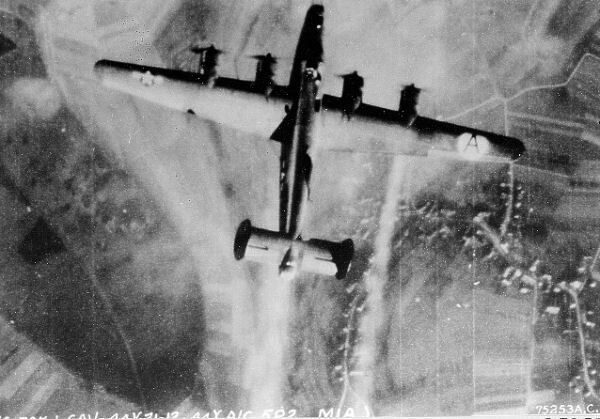 The slightly greater speed of the B-24 versus the B-17 meant that coordinating missions was problematic, and the B-24s were often relegated to the rear of combat formations over Europe, where they took most of the punishment. 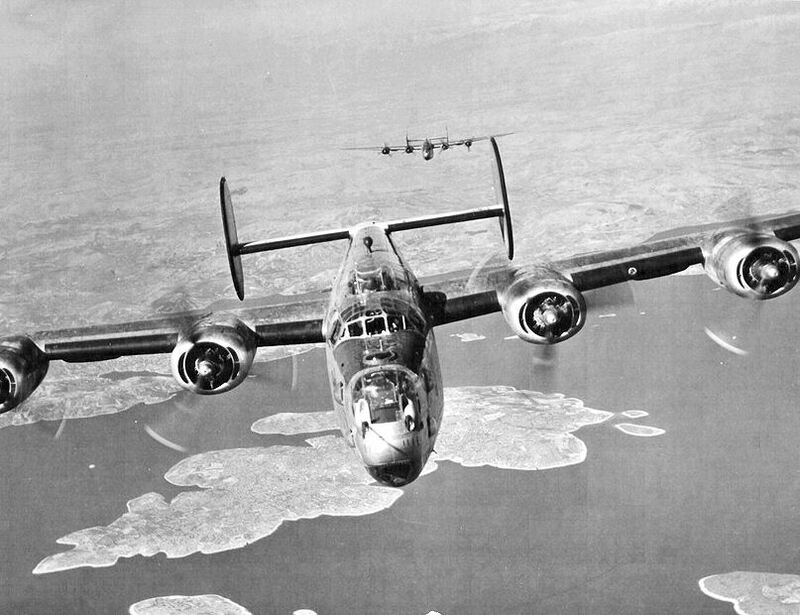 However, the reputation of the B-24 as less rugged than the B-17 may have been largely a matter of perception. Actual loss statistics do not support the claim. The greater popularity of the B-17 may simply be a matter of aesthetics: Most aircraft enthusiasts considered it a beautiful aircraft, while the B-24 was boxy and its high wing placement looked awkward. About a third of all B-24s were deployed to the Pacific, where their long range made them more suitable than the B-17. 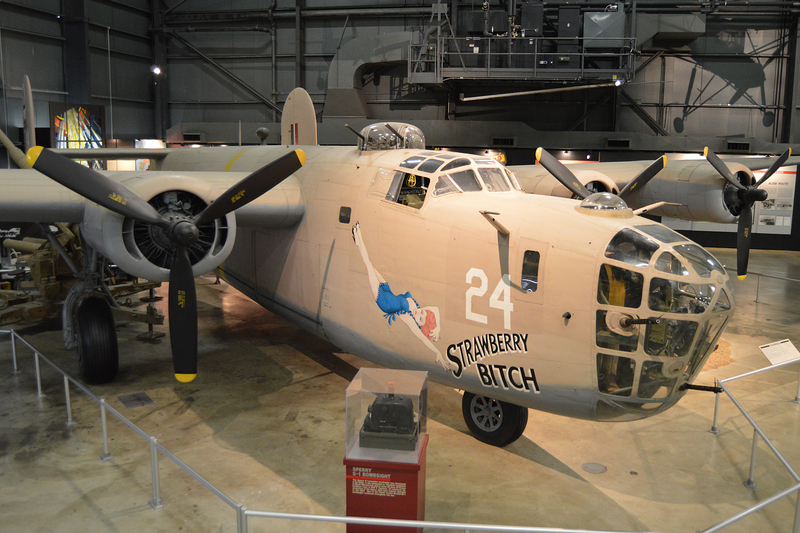 A number were allocated to the Navy as PB4Y search planes.This made the B-24 the backbone of the American heavy bomber force in the Pacific until the introduction of the B-29 late in the war.